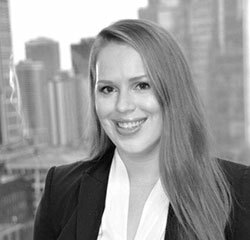 Meagan Leslie is an associate in Global IP’s Chicago office. Ms. Leslie is involved with all aspects of patent monetization, including infringement analysis, agreement drafting, portfolio marketing and due-diligence document generation. She has experience with portfolios ranging in size from a single patent to hundreds of patent assets. Ms. Leslie holds a J.D. from Northwestern Pritzker School of Law. She received a B.Eng. in Mining Engineering from Queen’s University. Ms. Leslie is licensed to practice law in Illinois.